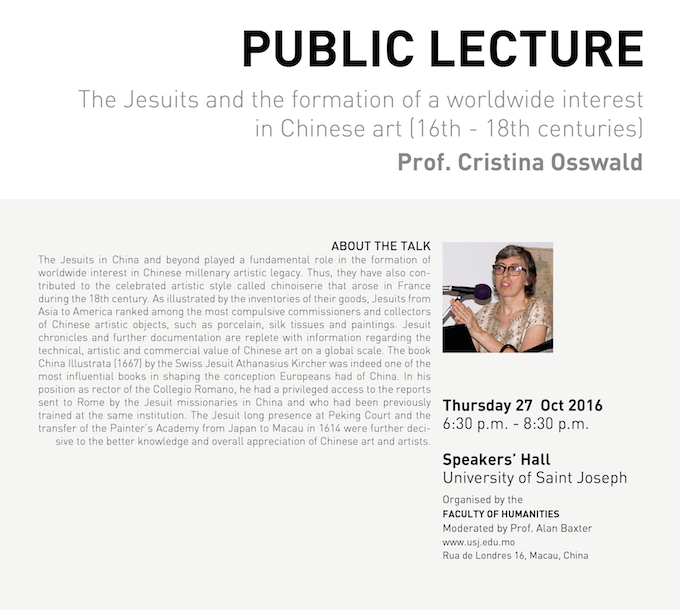 The Jesuits in China and beyond played a fundamental role in the formation of worldwide interest in Chinese millenary artistic legacy. Thus, they have also contributed to the celebrated artistic style called chinoiserie that arose in France during the 18th century. As illustrated by the inventories of their goods, Jesuits from Asia to America ranked among the most compulsive commissioners and collectors of Chinese artistic objects, such as porcelain, silk tissues and paintings. Jesuit chronicles and further documentation are replete with information regarding the technical, artistic and commercial value of Chinese art on a global scale. The book China Illustrata (1667) by the Swiss Jesuit Athanasius Kircher was indeed one of the most influential books in shaping the conception Europeans had of China. In his position as rector of the Collegio Romano, he had a privileged access to the reports sent to Rome by the Jesuit missionaries in China and who had been previously trained at the same institution. The Jesuit long presence at Peking Court and the transfer of the Painter’s Academy from Japan to Macau in 1614 were further decisive to the better knowledge and overall appreciation of Chinese art and artists.